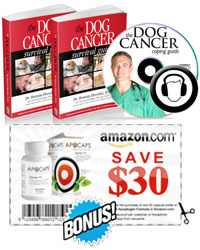 Dog Cancer Survival Guide On Sale! Download dr Demian Dressler’s Dog Cancer Survival Guide: Beyond Surgery, Chemotherapy & Radiation for Kindle. On sale now for more than half off at Amazon! Download Henry Meets A Three Legged Dog e-book for Kindle to help teach children about how well Tripawds do on three legs. Save on Amazon Kindle with Special offers, savings and accessories.